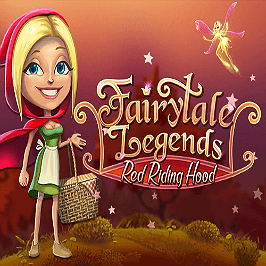 Fairytale Legends: Red Riding Hood online slot game is the first in a series of slots that takes classic fairytale characters and transforms them into bonus-filled slots. 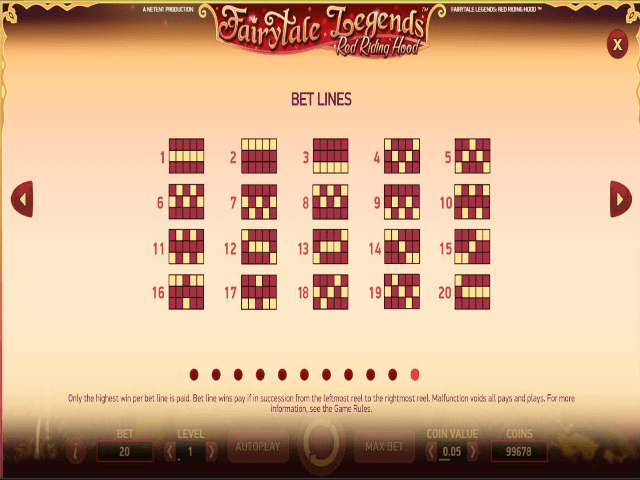 NetEnt chose the recognisable Red Riding Hood for its first foray into the land of fairytales, crafting a 5-reel, 20-payline online slot around the titular character. Check out this guide to Fairytale Legends: Red Riding Hood slot machine to find out just why granny’s eyes are so big! Not to confuse with Little Red Riding Hood, Fairytale Legends: Red Riding Hood online slot seeks inspiration from the 10th century story that has been adapted and woven into different cultures around the world. The original tale can be traced back to Italy, although the Brothers Grimm reinvented it for their own collection. For its video slot adaptation, online casino software provider NetEnt has picked the modern romanticised version that casts Red as the contemporary heroine. The blue-eyed blonde watches the game from the left hand side of the reels, smiling when you win or strike some of the special features on offer. Not only is there plenty of bonuses to keep you satisfied for a long time, but Fairytale Legends: Red Riding Hood offers a handsome return-to-player (RTP) rate of 96.3%. 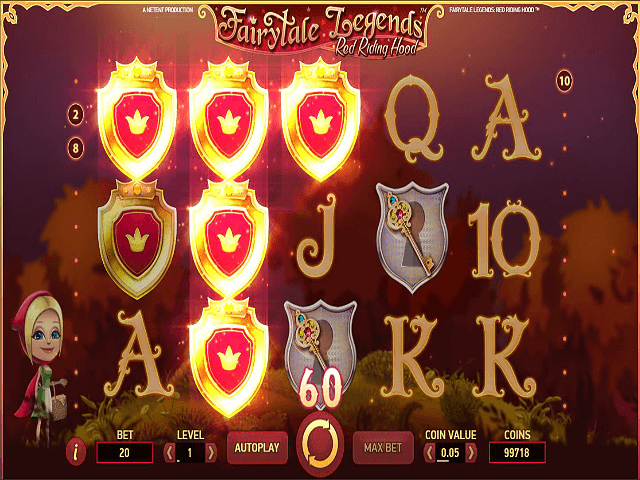 A magical fairy appears at the start of the Fairytale Legends: Red Riding Hood slot game, and activates three of the slot game’s random features. The Fairy Magic Spin conjures a cluster of identical symbols on the reels for one spin, increasing the chances of a winning payline. This does not include the highest paying symbol, the game’s logo icon. 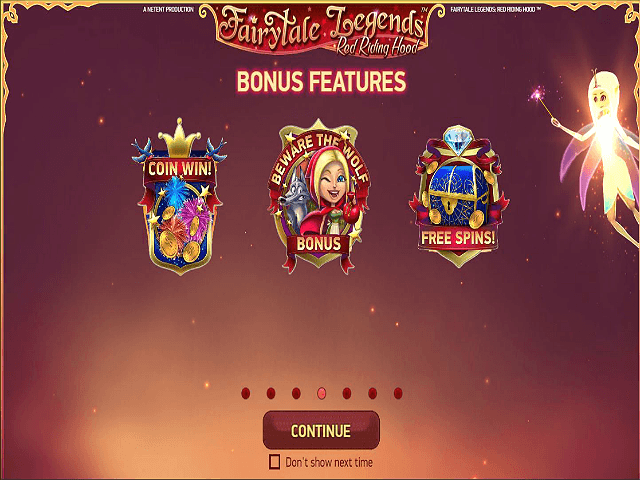 The second slot feature, the Fairy Surprise, only occurs if you did not win on the previous spin. The slot random picks one symbol of medium value, and then all the symbols lower than that are magically recast as that same symbol, until you win a prize. The final fairy bonus is the Fairy Wild Spin, and it is less random than the others. You have to score two or more Red Riding Hood wilds on the middle three reals. When this happens, up to four sticky wilds can land on the same three central reels. Bonus rounds seem to come in threes in this slot. The scatter treasure chest symbols must land on reels one, three, and five to give you the chance at some of the other bonus rounds. Once they do, you then need to pick one of the trio of chests. Prizes include coin wins, which can pay up to 15 times the original wager, or up to 10 free spins. However, it can also trigger the Beware the Wolf bonus board game round. Beware the Wolf transports you to a winding path through the treacherous forest. Help Red navigate her way around by spinning the wheel, collecting prizes as you go. She can hit upon a Coin Win, Double, Arrow, Jackpot Coin Win, or Collect, with a maximum 20 times multiplier to play for. 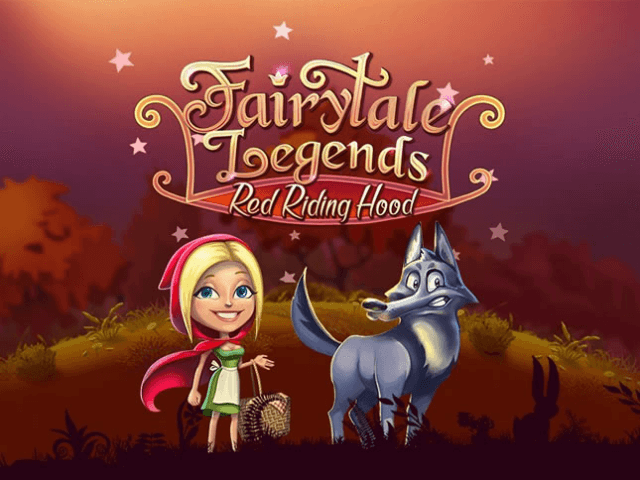 In short, the Fairytale Legends: Red Riding Hood slot game offers narrative, a range of bonuses, and the potential for wolfishly big wins. If you like Fairytale Legends: Red Riding Hood - You'll like these slots too!